Honda figures prominently in both the ALMS and the IRL. The Acura LMP2 cars debutted this year and are currently running second in the manufacturer standings to the Porsche RS Spyders. In line with Acura's place as a sport luxury brand, they decided it was worthwhile to compete in the more technological and competitive ALMS against the likes of Audi, Porsche and all the brands in the GT classes. 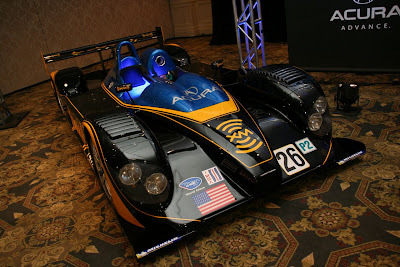 The new ALMS V-8 was designed completely in-house at HPD with no outsiders involved. The Acura engine is also the first Honda race engine completely designed outside of Japan, with all the work having been done in California. The Highcroft team has focused on chassis development while the Fernandez team with the proven Lola chassis has been the primary engine development team. Andretti-Green gets all the benefits of the other two. The result of all this work was that the Acura won the LMP2 class at the Sebring opener and has run competitively all year long. For 2008, Acura is planning a major revision of the Acura chassis targeted at further performance improvements and more importantly the serviceability of the car. The current car is difficult to repair during a race and that needs to be improved, especially for longer races. Over on the IRL side, Honda is currently the sole supplier of engines since Toyota and GM dropped out at the end of the 2005 season. One aspect of the lack of competition is that Honda doesn't have to stress their engines to the limit. 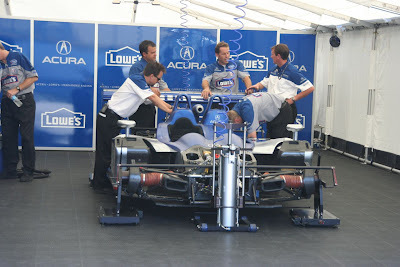 In spite of the cars being as fast as ever, they haven't had a single in-race engine failure in 2007. The current engine is a 3.5L V-8 that runs on 100 percent ethanol.